The Salon is happy to bring its next Pop-Up to The Artist Co-op--a new co-working space just for artists where you will feel right at home. At this month's Salon, meet three artists who fuse their art with their activism to make their voices heard. A riveting story of love, integrity, and compassion, 90 DAYS explores a beautiful couple's relationship and their life-altering decision after ninety days of dating. Fueled with gripping performances by an extraordinary cast of actors led by Teyonah Parris and Nic Few, 90 DAYS is a groundbreaking cinematic piece of art that confronts the human experience of overcoming one of life's greatest perceived challenges. Written by Nathan Hale Williams and directed by Williams and Jennia Fredrique Aponte, the film is entertaining, authentic and a visual masterpiece. Based on a true story, 90 DAYS is a film that will touch hearts while navigating the definition of ultimate compassion. Executive Producers: Jussie Smollett, Nathan Hale Williams, Richard E. Pelzer II & Sol Aponte. As a designer, Cheryl McCarron has designed costumes for over 125 theatre, dance, and film productions. As a shark conservationist, the number of sharks she has saved is impossible to count. She has been fortunate to be able to combine her two passions and use her creativity to help further the cause of animal welfare and conservation. She is the Campaigns & Outreach Director for Shark Angels. Rescheduled: Next Stop...The Artist Co-op! Right at the crossroads between Venezuelan folklore and contemporary music lays the soul of the Luis D’Elias Ensemble (LEDens for short). The New York based multi-cultural ensemble has dedicated its musical craft to developing a true blend of modern jazz harmonies, classical structures, rock and roll energy and Latin grooves, having South American and Venezuelan folklore as the melodic and rhythmic anchors of the ensemble’s repertoire. Founded in 2012 within the melting pot of Boston, the group is conformed by Venezuelan composer and guitarist Luis D’Elias; pianist and composer Evan Waaramaa; drummer and percussionist Brendan Pajak; and bassist P.J. Duffy, all hailing from the New England. The ensemble is also known to feature a wide range of guest musicians from around the world, being able to expand its color palette with horns, Latin percussion, strings and vocals. This blend of American and Venezuelan musicians is integral to the unique fusion of modern jazz, rock and pop idioms with folkloric South American rhythms. The Salon is happy to bring its next Pop-Up to The Chipped Cup! How do we lose our relationships, our cultures and ourselves? How do we reconnect? See how our three featured artists answer these questions and more. Chipped Cup food and drink will be available until 8pm. Traditional Serbian Vocal Group ROSA is a NYC based, all-female ensemble that unites singers from 3 different continents with a mission to preserve and nurture the authentic form of traditional, non-tempered singing from Serbia. ROSA performs endangered form of Serbian folk songs that were conceived and carried by women through centuries of hardship. The group was formed by Marija Stojnic, documentary filmmaker and traditional Serbian music vocalist, and Aleksandra Denda, vocalist, composer and Berklee College of Music Alumna. The concept of the ensemble was inspired by Marija's documentary titled Girl Who Opposed the Sun. Since its inception in 2013, ROSA has performed at numerous and critically acclaimed venues and events including Carnegie Hall, MoMA, Boston University Theater, The Collective School of Music, Mendocino Music Festival, Festival Zlatne Uste. The group also participated in benefit concerts organized by Leitmotiv Arts and Cambridge Global Arts, supporting Serbian/Balkan communities in need. New York Folklore Society (NYFS), East European Folklife Center (EEFC), Brooklyn Arts Council (BAC) and Cambridge Global Arts have endorsed ROSA. DRIVING WITH YOUR EYES CLOSED! It's time for the Winter Salon, an evening joining together all disciplines of art - from different forms of music to design, humor, theatre and visual art. We are building a community open to all the arts--high-brow, low-brow, popular, classic, traditional, experimental, and everything in between--and committed to audiences' exploration and exposure to different viewpoints and experiences. 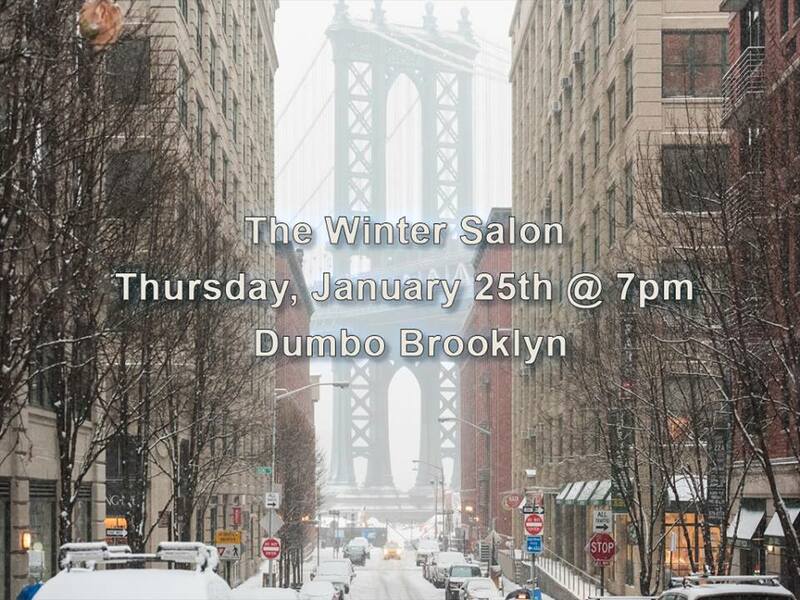 The Salon will be held January 25th at a loft in DUMBO at 7:00pm. Exact address will be provided to those who RSVP. Kevin Ray is a theater director, applied theater practitioner and theater educator. Most recently, Kevin directed Neighborhood 3: Requisition of Doom by Jennifer Haley at Rattlestick Playwrights Theater and Scenes from Family Life by Mark Ravenhill at Brooklyn College. He has directed productions of Twelfth Night, Macbeth, Monty Python’s Spamalot, and The Chrysalids (David Harrower’s adaptation of John Wyndham’s novel). He has also worked with the CAT Youth Theater program at The Creative Arts Team/CUNY, supporting young people in devising original theater inspired by themes and issues important to them. In his work as a teaching artist, Kevin facilitates arts enrichment programs that deepen young people’s experiences of performances at Lincoln Center Theater and The New Victory Theater. Kevin has received grants for his work from Brooklyn Arts Council and was a 2017 recipient of the Tow International Research Stipend which supported his experience attending La Mama International Directors’ Symposium in Umbria, Italy. Kevin holds an MA in Applied Theater from CUNY School of Professional Studies and is an MFA directing student at Brooklyn College. Michael Redman is a designer and theatre-maker drawn to new works and collaborations that explore the intersections of technology and story-telling. Michael is the Assistant Technical Director for Brooklyn College's Department of Theatre while simultaneously pursuing his MFA in Design. Before moving to New York in Fall 2016, Michael was the Production Manager at Georgetown University and a freelance designer and technician for many producing companies in Washington D.C. In 2015, he was nominated for DC’s Helen Hayes Award for Lighting/Projections Design for his work on Theatre Alliance’s NPN Rolling World Premier of Dontrell Who Kissed the Sea. In addition to supporting Brooklyn College's esteemed program, Michael has worked on several exciting projects in the City, including designing Projections for Brooklyn College’s Production of Jennifer Haley’s Neighborhood 3: Requisition of Doom at Rattlestick Playwright’s Theatre and Llama Theatre's The Woman Who Shed Her Skin that performed at Dixon Place, HERE Arts Center and the Brighton Fringe Festival (UK). Michael is excited to expand and explore his awareness and engagement with the communities and artists in New York and beyond. At a social event way back in 1982, John Walter was feeling great as he went into the bathroom. However, upon seeing his reflection in the large mirror, once again he felt fake and self-conscious, becoming instantly self-critical. But where the medicine cabinet mirror met the full-sized wall mirror at just the right angle, he saw something totally new: his true reflection. Unlike the person from before, this genuine self was full of joy, free of those same crippling self-judgments. Transformed by this realization, John founded True Mirror in 1992, perfecting the optics, discovering the science behind the true reflection, and then bringing this uplifting discovery to the world. Stephen Lyons is a Musician/Actor and songwriter based in Harlem. His voice has drawn comparisons to Jeff Buckley, Morten Harket, Bono, James Taylor and Freddie Mercury. Stephen is the frontman for NYC based Bonfire Falls featuring the Broadway talents of Ryan McCurdy, Erikka Walsh ('Once The Musical'). The band features a diverse sound combining Broadway Rock, Indie and Progressive Rock. They released their debut EP, 'LIFETIME' in May of 2016. As a solo Artist in 2007 he released Album ‘Fall’ in 2007. He is currently working on material for a new solo album and a new album with his band. 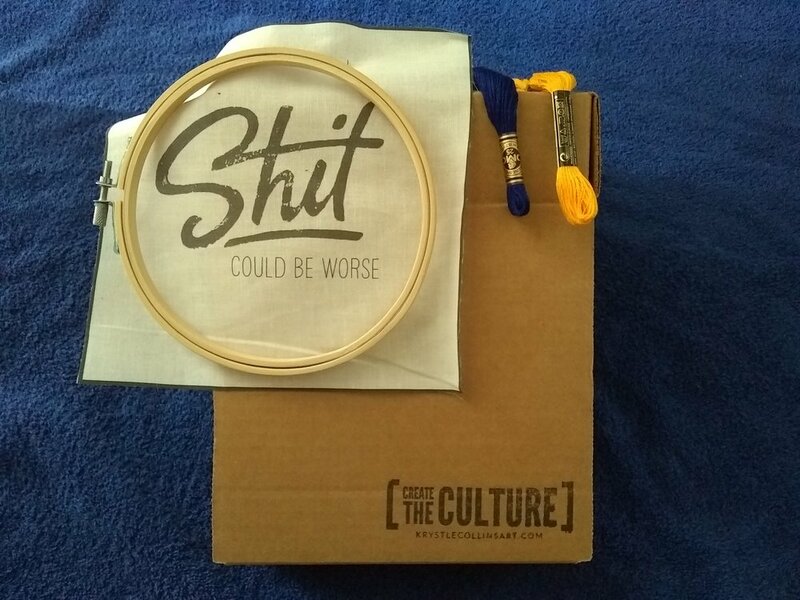 This time, we will be raffling off an original [Create the Culture] embroidery kit from November Pop-Up Salon Featured Artist Krystle Collins. 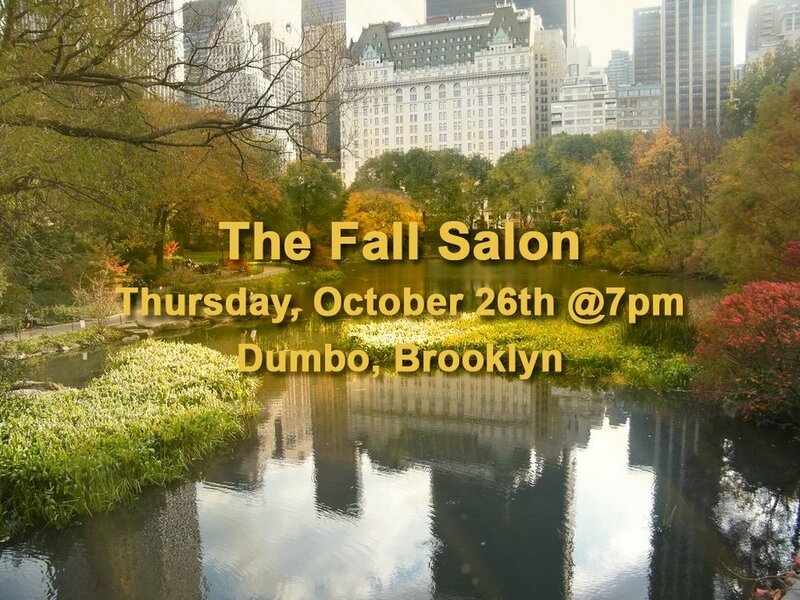 The Salon is happy to bring its next Pop-Up to the Chipped Cup! Join us Friday, November 10th at 7:30pm to explore how the people who come before and after us impact our art and our lives. Chipped Cup food and drink will be available until 8pm. Gloria Rosen--Actor/Playwright performing a selection from her one-woman show LISTEN...CAN YOU HEAR ME NOW? MITCHELL SCOTT LEWIS has been a professional astrologer in New York City for more than two decades. His specialties include medical chart interpretations and financial astrology. Throughout the 90’s he worked on the floor of the New York Mercantile exchange as an astrological trader and market analyst. In “Living By Starlight”, his ongoing monthly newsletter, and in his lectures and numerous appearances on national radio and TV he has accurately predicted a number of world events, including 9/11, the unprecedented rise of oil prices in the 90's and early 2000's, the exact collapse of the housing market and the ‘08 stock market crash, which he precisely foretold within days of its occurrence more than a year in advance. As a regular guest on Coast to Coast A.M. with George Noory, he appears several times a year to discuss astrological issues regarding the economy, politics, and the future of our society. Mitchell lectures on astrology and the financial markets throughout the U.S., most recently at the NCGR National Conference in Baltimore February 2017. He is the author of the Starlight Detective Agency books, an ongoing series featuring protagonist astrologer/detective David Lowell, published by Poisoned Pen Press. The books are based in New York City, and are available everywhere. The third novel in the series, Evil in the 1st House, has recently been released. KRYSTLE COLLINS is a native of Louisiana, currently living and working in New York, NY. A self-taught artist, her interest began at a young age and has been cultivated over the years. Growing up in a small Southern church inspired her to capture the intimacy of the human figure. Studying the emotion-filled faces, the slightest turn of a body, and even the careless placements of a hand, sparked her curiosity about the forms that surround us daily. Her work explores the direct relation between the observation and interpretation of love, pain, joy, power, melancholy, anxiety and stimulation. The subjects, often female, are portrayed in a light that embodies strength, with a sense of familiarity that allows the audience to connect. Using bold lines, shapes and posture to depict her vision, Krystle’s work captures and appreciates the beauty in identifying the outer expression of our inner nature. Thank you so much to everyone who came out last night! It's is so encouraging and energizing to be in a room full of such graciousness and generosity. If you are interested in Brian Yang's screening, which was announced last night, he can be reached at PRODUCTION@SNAKEHEADMOVIE.COM. Check out his website. See you at our pop-up on November 10th at The Chipped Cup and our Winter Salon on January 25th! Join us at our usual location in DUMBO, or RSVP to receive the location. Gerit Quealy began her career as an actor, most notably in Ryan’s Hope on ABC & in Shakespeare onstage understudying Phoebe Cates at the Goodman Theater in Romeo & Juliet & herself in the title role opposite Robert Sean Leonard in New York. She turned to writing & research almost 25 years ago where she lit upon the Renaissance tenet of "Learning through Delight" which is the core of all her projects. As a journalist, she’s covered everything from dollhouses, birdhouses, beauty, brownies, & brides, in outlets such as the New York Times, Country Living, Woman's Day, NBC’s ...and an array of gardening magazines. She’s a passionate paleographer & just discovered, and published an academic article on, a handwritten letter from Philip Herbert, one of the brothers that the Shakespeare First Folio is dedicated to. Sumie Hasegawa trained as a concert pianist — drawing was one of the few hobbies open to her, to keep her hands from harm. After recovering a prize in graphic design she moved from Japan to New York City where she eventually trained as a textile designer at FIT. While designing costumes for a roving Shakespeare production, her husband was performing, the flowers kept beckoning to her, prompting her to pick up the paint-brush once again. 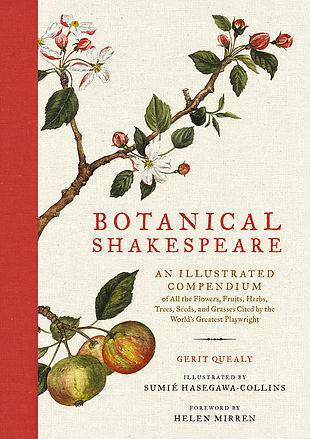 Ophelia’s garland speech led to a passion to paint all the plants in the canon! 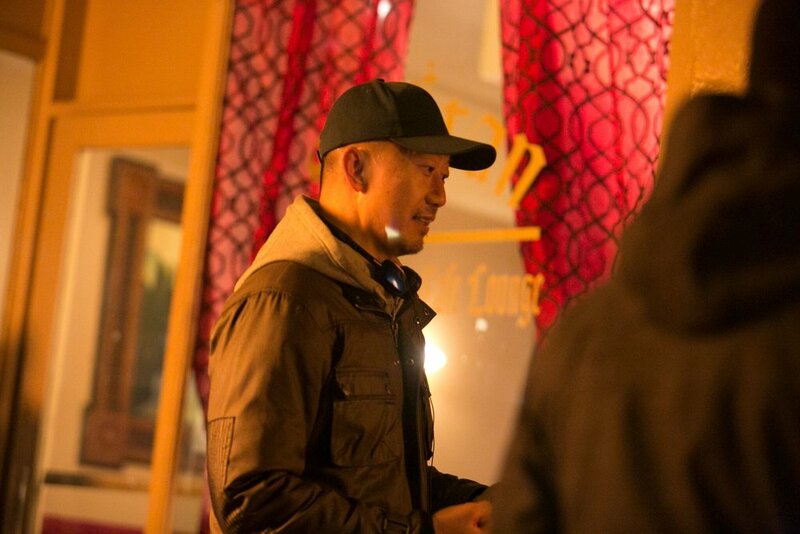 Hank H. Kim is the Creator, Writer & Co-Director of “Laying Low,” a half-hour dramedy pilot for a series chronicling the adventures of its protagonist, David Estrada, a thirtysomething Filipino-Chinese American, newly released from prison after serving 5 years for trafficking Meth and MDMA (Molly). Dave isn’t your typical small-time drug dealer; he was a Harvard Phi Beta Kappa on the partner track at one of Wall Street’s most prestigious corporate law firms before his life was derailed. “Laying Low” tracks Dave as he embarks on his 2nd chance in life, a life in which he is determined to be spiritually and emotionally invested. Each of the complex and colorful characters that truly represent the gamut of New Yorkers will serve to either contribute to Dave’s redemption or knock him off his path. Mark Loewenstern is a three-time finalist for the Heideman Award and a winner of the Sam French OOB Festival among others. Plays: Parish Dunkeld, Carnality, One is the Road, The Bloomingdale Road, The Slightly Exaggerated True Story of Civic Virtue, The Nastiest Drink in the World. Films: 6 Love Stories (w. Alicia Witt), Holiday Rumble. He is currently researching a play about real-life 60-year old serial killer Dorothea Puente. Jeffrey Greenberg is a jazz pianist based in Reston, Virginia, near Washington, DC. While he has retired from a successful career as a neurological surgeon, music has always been his first love. During college he worked as a drummer on contract with Columbia records. He soon became devoted to piano and jazz standards, formed a band, and appeared in numerous public and private events around Washington. Recently, he has played at the prestigious Arena Stage in Washington DC, and performed and collaborated with national recording artist Rich McCready, member of the Missouri Music Hall of Fame and 2016 Josie award-winning Male Songwriter of the Year. He's also performed with the recording artist and jazz bassist David Finck, who worked extensively with Andre Previn noted jazz pianist and conductor of the London Symphony Orchestra for many years. Earlier, Jeffrey has enjoyed playing for Margaret Thatcher during her U.S. visit, and for George W. Bush, at the noted Manhattan Piano bar Arturo's, and at the 5-star Greenbriar Hotel in West Virginia. You may find him playing at the Tysons Galleria, a premiere shopping, dining, and entertainment venue in McLean VA, and in restaurants and cafes in the greater Washington DC area. Join us for our August Pop-Up! Did you know you could paint? Write a haiku? It's time for the Summer Salon, an evening joining together all disciplines of art - from different forms of music to design, humor, theatre and visual art. We are building a community open to all the arts--high-brow, low-brow, popular, classic, traditional, experimental, and everything in between--and committed to audiences' exploration and exposure to different viewpoints and experiences. The Salon will be held July 27 at a loft in DUMBO at 7:00pm. Exact address will be private messaged to those who responded "yes" closer to the date of the event. Sabrina Bianca Guillaume--Costume Designer: A Brooklyn girl to the core! Sabrina Bianca Guillaume was born, raised, and resides in Brooklyn, New York. From an early age she fantasized over costumes and fashion and its ability to tell a story. Working as a freelance costume designer for dance, theatre, and film in New York City, and wherever else her projects takes her. She has and continues to push the mark in working with fellow artists. She credits the beginning of her journey to be dressing in her Sunday best for church and designing costumes for her dance group as a teen. 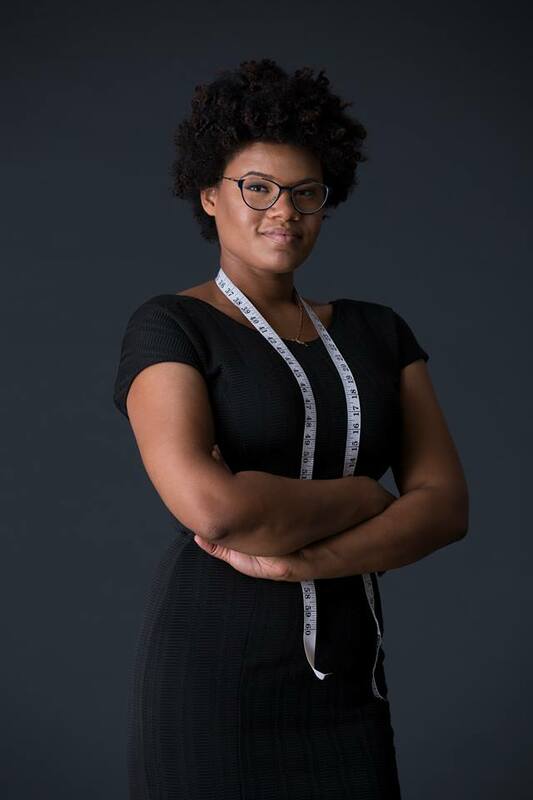 Learning the basics of sewing in her costuming class at Edward R. Murrow high school, she continued on in receiving her BA in English and Theatre Arts at CUNY John Jay (2014). Most recently she received her MFA in Theater, with a concentration in design and technical production from CUNY Brooklyn College (2017). Olive B. Persimmon--Author, Speaker & Communcation Coach: Olive Persimmon is an author, speaker, writer and everyone's favorite celibate. Mostly, because there’s a very small number of publicly-outed accidental celibates (for a reason). Her first book is called Unintentionally Celibate and She's currently working on her second book, The Coitus Chronicles. When she's not writing or speaking, she teaches public speaking, comedic storytelling, and improv for communication. In her free time, she enjoys writing letters to friends and coming up with new speeches. You can learn more at olivepersimmon.com or by adding her on Facebook. Chris Harcum --Playwright/Lead Actor for Elephant Run District's Martin Denton, Martin Denton: Chris Harcum is an award-winning actor, playwright, and Indie Theater Hall of Fame inductee. His solo play, “Green,” was published in the “Best of 2011 Collection” on Indie Theater Now.Since moving to New York City in 2002, over 20 of his works have been seen on NYC stages. His full-length plays include “Trading Lunches,” “Rabbit Island,” “Milk & Shelter,” “Instant Gratification,” and “The Devil in Ms. Spelvin.” Chris co-adapted and played the title role in a modern version of Moliere’s “The Hypochondriac.” He has performed in nearly 200 projects as an actor. As a solo performer, he has created and performed “American Gun Show,” “Some Kind of Pink Breakfast,” “Gotham Standards,” “Anhedonia Road,” “Mahamudra,” “The Preservationist,” “Things Your Don’t Know,” “Weight and Weightlessness,” and “American Badass (0r 12 Characters in Search of a National Identity),” which was published in the Plays and Playwrights 2009 anthology. Many of these pieces, along with his plays “Rabbit Island” and “We Haven’t Told Anyone About This,” are published on Indie Theater Now. Chris served as Managing Director for the League of Independent Theater for three years. He is the recipient of the Leading Lights of Independent Theater Award for his ongoing advocacy and support of Off Off Broadway. www.chrisharcum.com.